reinforced with two brigades and special units, including Maglan. On 30 Mairch 2018, a six-week campaign composed o a series o protests wis launched at the Gaza Strip, neist the Gaza-Israel border. Cawed bi Palestinian organisers the "Great Mairch o Return", the protests demand that Palestinian refugees an their descendants be allowed to return tae whit is now Israel. They are awso protesting the blockade o the Gaza Strip an the muivin o the Unitit States Embassy in Israel frae Tel Aviv tae Jerusalem. Veeolence durin the protests haes resultit in the deedliest days o the Israeli-Palestinian conflict since the 2014 Gaza War. ↑ "Palestinians carry on rallies in Gaza on third consecutive Friday – Xinhua – English.news.cn". Xinhua News Agency. ↑ al-Mughrabi, Nidal. "Israeli forces kill three Gaza border protesters, wound 600: medics". ↑ Ari Gross, Judah (18 April 2018). "Kite from Gaza sets fire to wheat field in Israel". The Times of Israel. 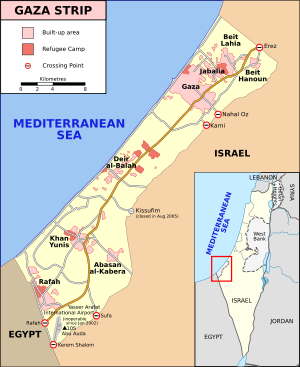 ↑ "Gaza protests: All the latest updates". Al Jazeera. ↑ Israel faces outcry over Gaza killings during Jerusalem embassy protests, Guardian, 15 May 2018, "Until this week, no Israeli had been harmed since protests began on 30 March. An IDF spokesman, Lt Col Jonathan Conricus, said one soldier had been “slightly wounded by shrapnel” on Monday but he did not have details on the source of the injury." ↑ Morris, Loveday; Balousha, Hazem (14 May 2018). "Israelis kill more than 50 Palestinians in Gaza protests, health officials say". The Washington Post. ISSN 0190-8286. Retrieved 14 May 2018. This page wis last eeditit on 3 Juin 2018, at 06:13.